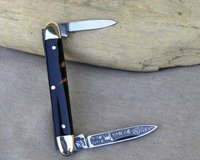 This is a 2 5/8 inch closed 2 blade Pen Knife and has the Standing Dog 1996 tang stamp. The master blade has a fancy Pitbull Trademark etch with Genuine Tortoise engraved on the reverse. 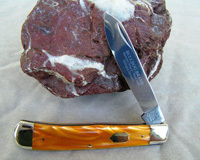 This knife with Genuine Tortoise Shell handles and is 1 of 3 Prototypes. 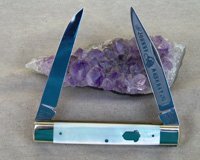 The knife scales were originally for J. Primble Belknap knives that were produced in the 1930?s. No more of these knives will be made-ever. This knife comes with a Certificate of Authenticity (COA), verifying that only 3 were ever made. This is a 4 inch closed 1997 Damascus Steel Lockback. It is 7 inches open. It features a 3 inch Genuine Damascus Steel Clip Blade with a laser engraved Standing Bulldog and Bulldog Brand Genuine Damascus. This knife has the 1997 Standing Dog Tang Stamp. 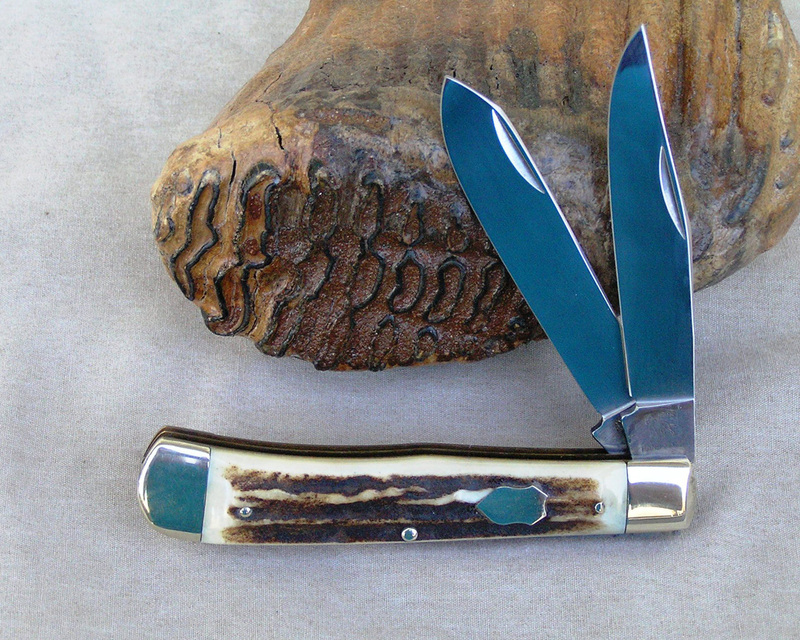 This knife has great Genuine Stag handles with a round shield with a Bulldog head inside. 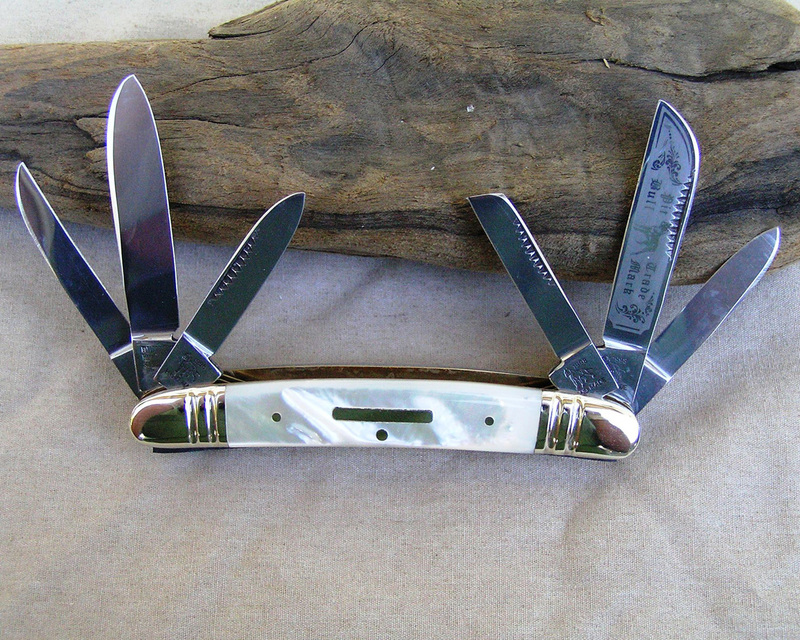 An unusual and highly collectable Bulldog Brand knife. Rare! This is a 4 1/8 inch closed 2 Blade Trapper. 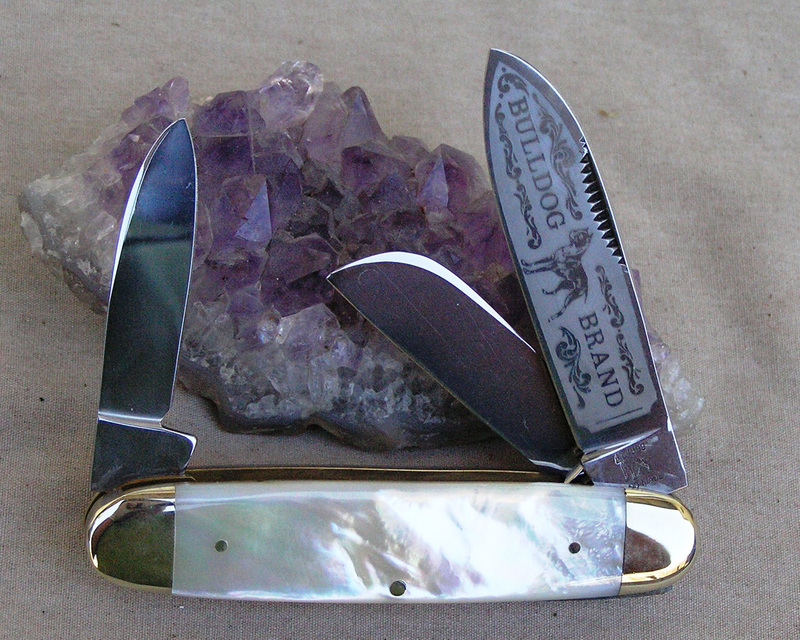 This knife features the Standing Dog 1997 tang stamp. The master blade has Bulldog Hammer Forged Hand Made Trademark in a black laser etch. The handles are Genuine Pearl with NO Shield. The bolsters are Factory Engraved and the reverse side of the main blade has “Salesman Sample” engraved on it. 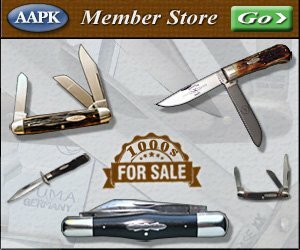 Bulldog Brand Salesman Sample knives are RARE. This is a 4 1/8 inch closed Trapper. 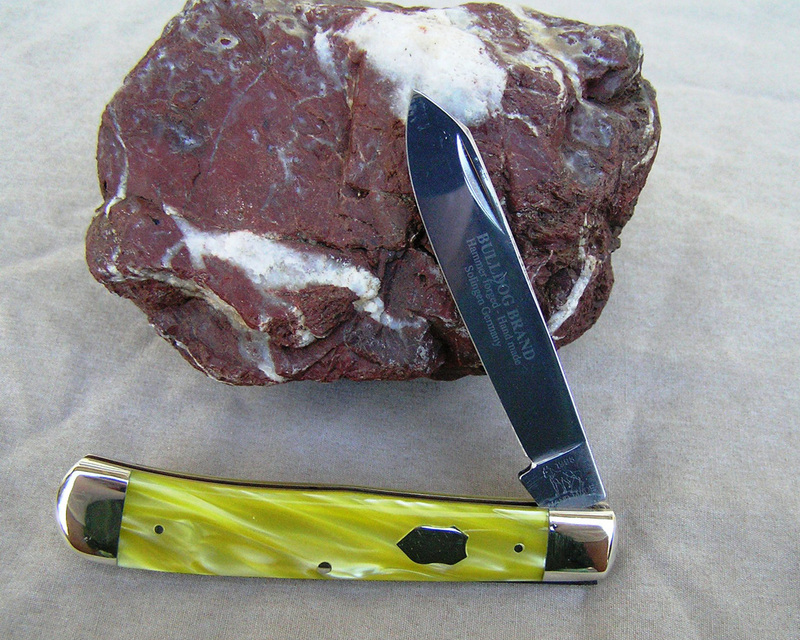 This knife features the Standing Dog 1998 tang stamp. The master blade has no blade etch and is engraved 1 of 7 on the reverse making it a rare low run knife. 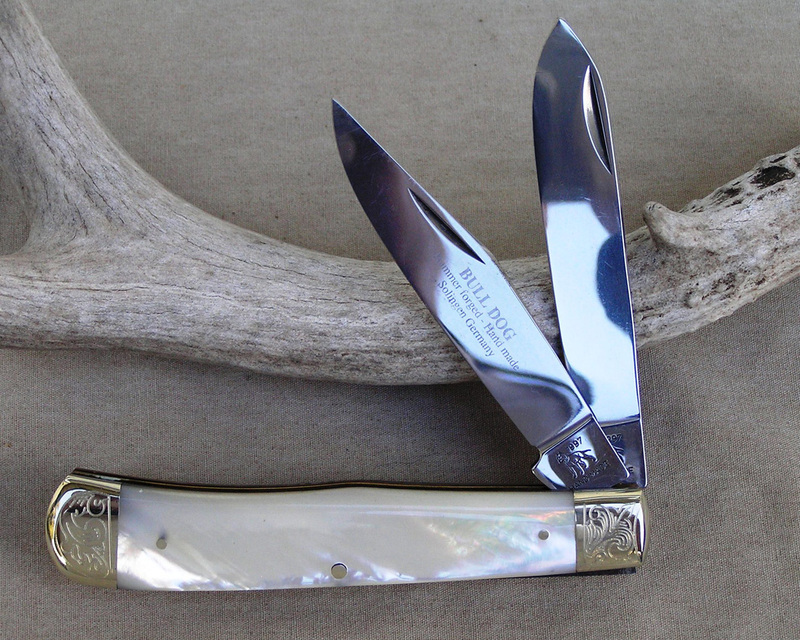 The handles Genuine Stag with a Crest Shield. RARE, 1 of 7. This is a 3 7/8 inch closed 2 blade Muskrat. This knife features the Standing Dog 1998 tang stamp. The master blade is etched with JOHNNY MUSKRAT. The handles are AAA1 Quality Pearl full of color and fire and has the Acorn Shield. 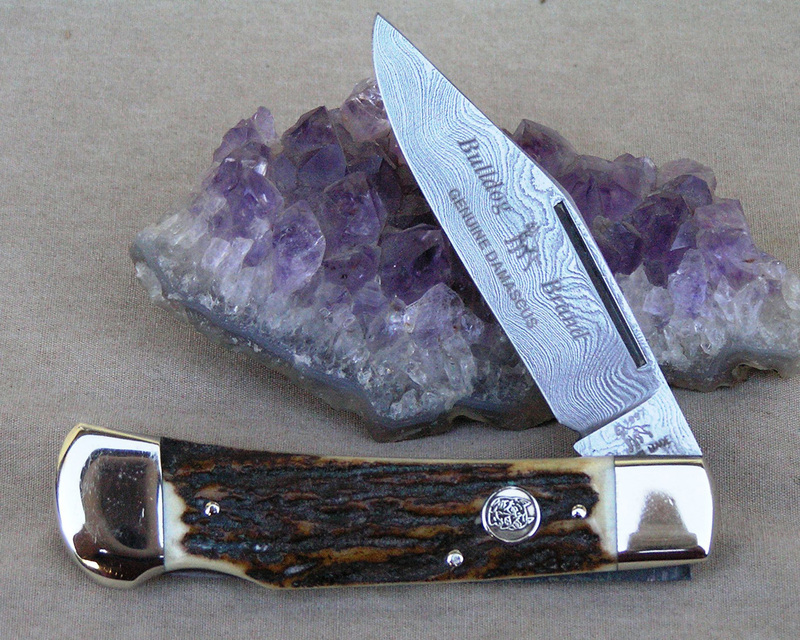 Made in 1998 to celebrate the 20th anniversary of Bulldog brand knives. Five different blade styles, five different blades etches, and five different tang stamps, which have been used over the past 20 years. Only 300 of each handle material were made. This knife is has handles of Brown Jigged Bone. 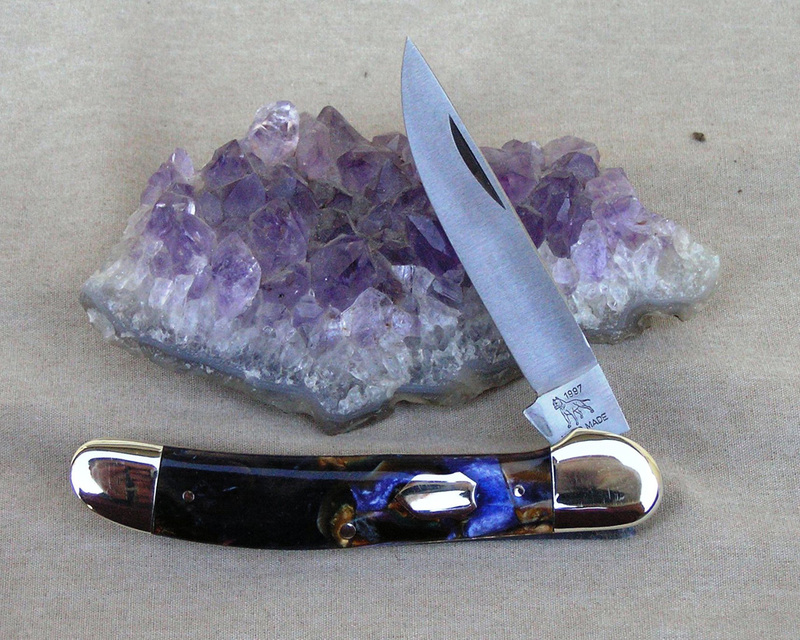 This knife also has the “20th” badge inlay shield. Measures 4 1/8″ closed. Came with a COA. 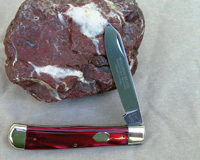 Made in 1998 to celebrate the 20th anniversary of Bulldog brand knives. Five different blade styles, five different blades etches, and five different tang stamps, which have been used over the past 20 years. Only 300 of each handle material were made. This knife has handles of Genuine Pearl. 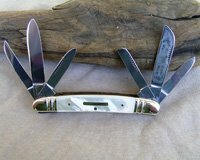 This knife also has the “20th” badge inlay shield. Measures 4 1/8″ closed. Came with a COA. Made in 1998 to celebrate the 20th anniversary of Bulldog brand knives. Five different blade styles, five different blades etches, and five different tang stamps, which have been used over the past 20 years. Only 300 of each handle material were made. This knife is has handles of Genuine Stag. 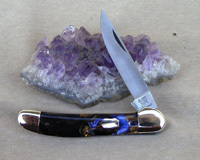 This knife also has the “20th” badge inlay shield. Measures 4 1/8″ closed. Came with a COA. Made in 1998 to celebrate the 20th anniversary of Bulldog brand knives. Five different blade styles, five different blades etches, and five different tang stamps, which have been used over the past 20 years. Only 300 of each handle material were made. 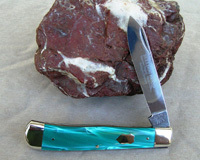 This knife is has handles of smooth red bone. This knife also has the “20th” badge inlay shield. Measures 4 1/8″ closed. Came with a COA. This is a 4 1/8 inch closed One blade Trapper. This knife has the Standing Dog 1998 tang stamp. The Single blade has BULLDOG BRAND Hammer Forged ? Hand Made Solingen Germany laser etched on it. 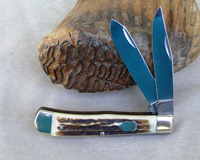 The handles are Bright Blue Celluloid with a Crest Shield. 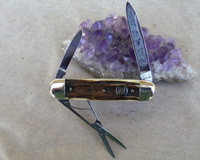 This is a 4 1/8 inch closed One blade Trapper. This knife has the Standing Dog 1998 tang stamp. The Single blade has BULLDOG BRAND Hammer Forged ? Hand Made Solingen Germany laser etched on it. The handles are Roman Bronze Celluloid with a Crest Shield. 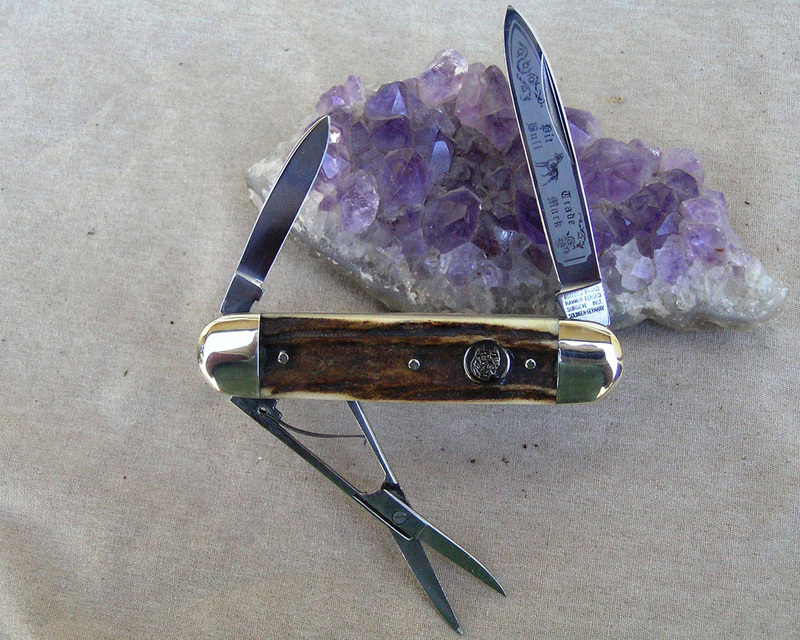 This is a 4 1/8 inch closed One blade Trapper. This knife has the Standing Dog 1998 tang stamp. The Single blade has BULLDOG BRAND Hammer Forged ? Hand Made Solingen Germany laser etched on it. 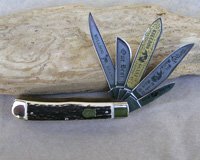 The handles are Green Celluloid with a Crest Shield. 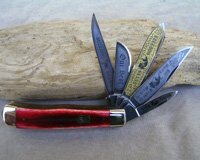 This is a 4 1/8 inch closed One blade Trapper. This knife has the Standing Dog 1998 tang stamp. The Single blade has BULLDOG BRAND Hammer Forged ? Hand Made Solingen Germany laser etched on it. The handles are Bright Orange Celluloid with a Crest Shield. 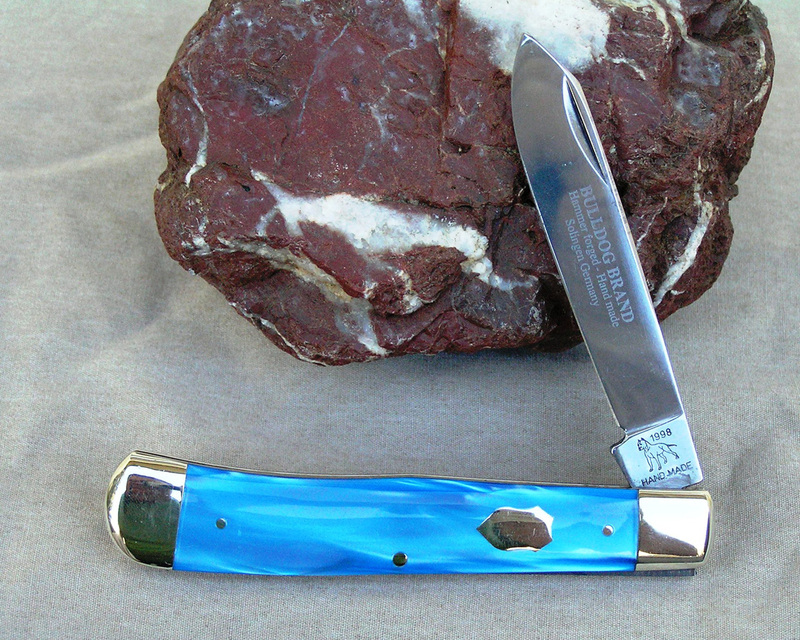 This is a 4 1/8 inch closed One blade Trapper. This knife has the Standing Dog 1998 tang stamp. The Single blade has BULLDOG BRAND Hammer Forged / Hand Made Solingen Germany laser etched on it. 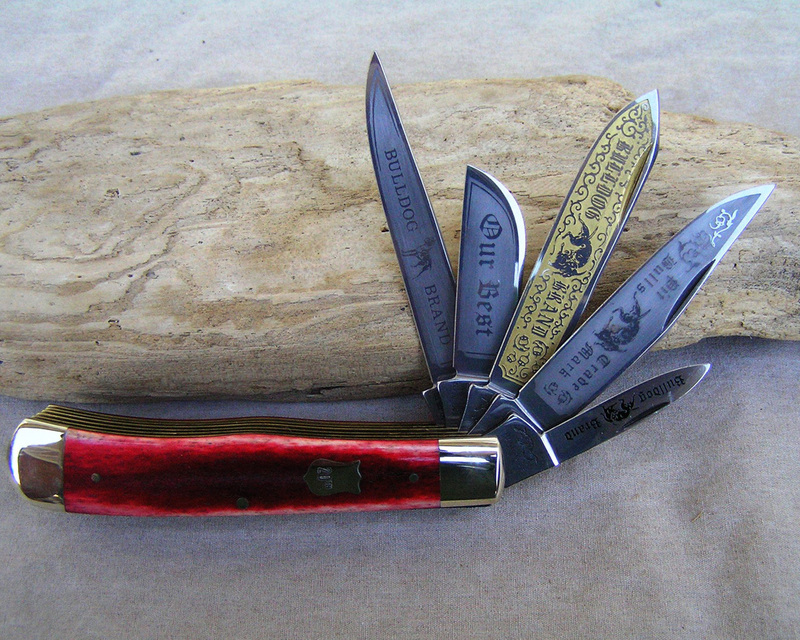 The handles are Bright Red Celluloid with a Crest Shield. This is a 4 1/8 inch closed One blade Trapper. This knife has the Standing Dog 1998 tang stamp. The Single blade has BULLDOG BRAND Hammer Forged ? Hand Made Solingen Germany laser etched on it. The handles are Bright Yellow Celluloid with a Crest Shield. This is a 3 ? inch closed Cattle King. 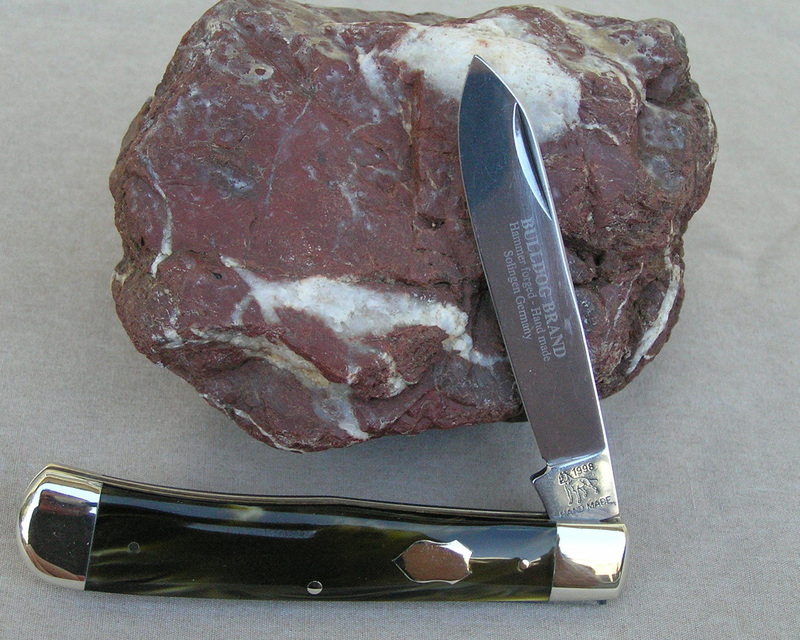 This knife features the Standing Dog 1999 Tang Stamp. The master blade is etched with the fancy Bulldog Brand Standing Dog Etch. The reverse of the master blade is engraved with “Prototype”. 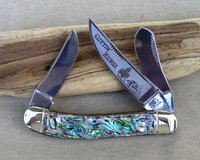 The handles are Genuine Pearl full of fire and color. This Prototype knife came with a COA. This is a 3 ? inch closed Cattle King. This knife features the Standing Dog 1999 Tang Stamp. 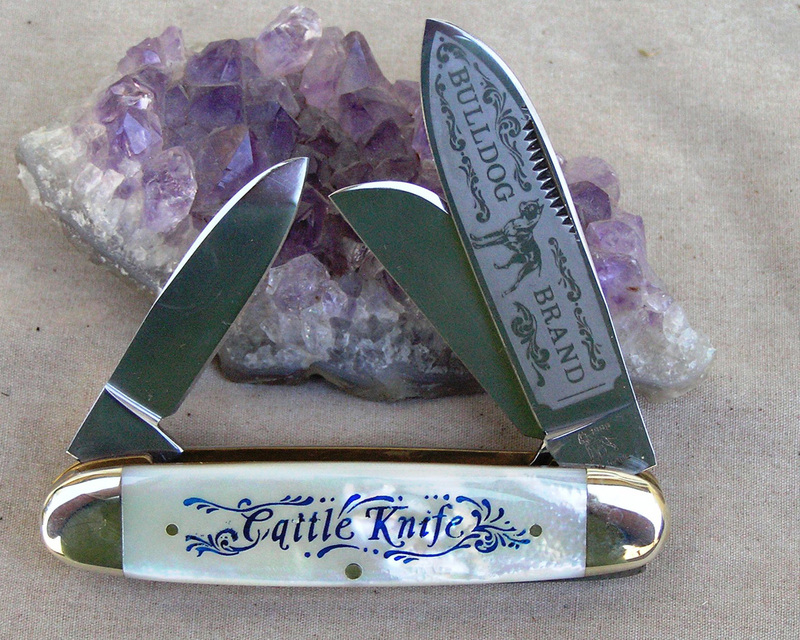 The master blade is etched with the fancy Bulldog Brand Standing Dog Etch. The reverse of the master blade is engraved with “Prototype”. 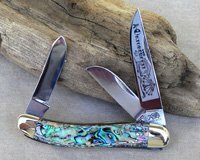 The handles are Genuine Pearl full of fire and color. 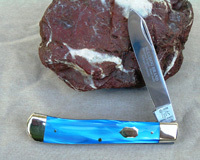 The pearl is Scrimshawed with a blue colored “Cattle King.” This Prototype knife came with a COA. This is a 3 1/4 inch closed Gentleman’s Knife. 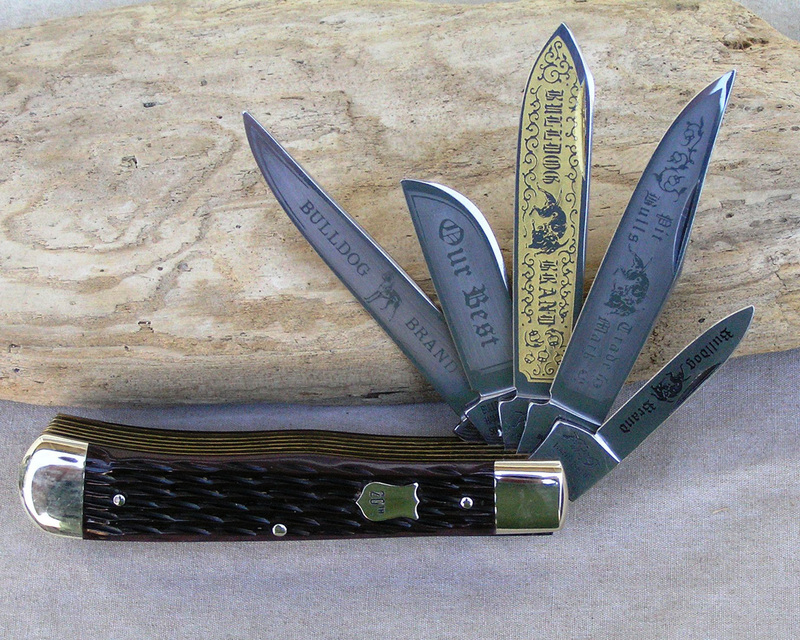 The master blade has the Standing Dog Brand etch and on the reverse is engraved “PROTOTYPE”. It also has a pen blade and scissors. The handles are Genuine Stag with a round Dog Head Shield. This one is referred to as a 3 blade Stag. This knife came with a COA. This is a 3 1/4 inch closed Gentleman’s Knife. 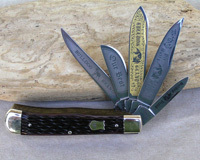 The master blade has the Standing Dog Brand etch and on the reverse is engraved “PROTOTYPE”. It also has a pen blade and scissors. 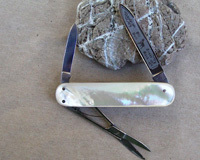 The handles are Genuine Pearl with a NO Shield and NO Bolsters. This one is referred to as a 3 blade Pearl. This knife came with a COA. This is a 3 ? inch closed 2 blade Canoe. This knife has the Standing Dog 1996 Tang Stamp. The blades have no etch and are identical Spear blades. 1 blade is engraved with 1 of 7. 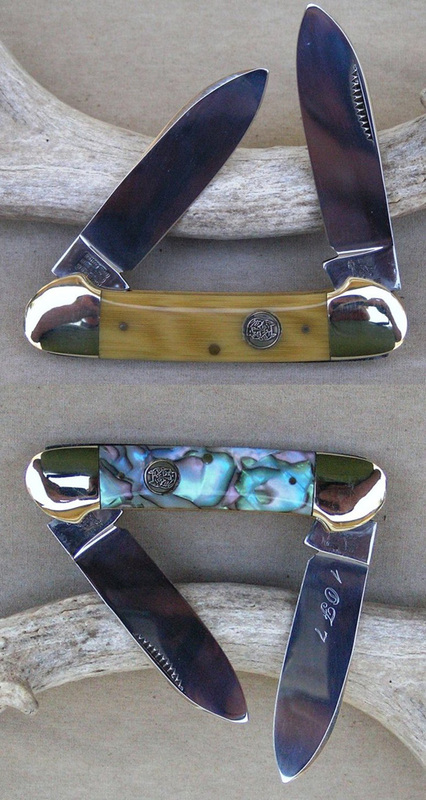 The handles are Waterfall Celluloid on one side and Abalone Celluloid on the other. Both sides have the Dog Head Shield. This knife was made in 1996 and only 7 were made. This was the beginning of the Fourth Generation. This is a 3 7/8 inch closed 6 blade Congress. The tang is stamped with the 1998 Standing Dog Stamp. The master blade has the Pit-Bull Trademark etch. The handles are Genuine AAA-1 Pearl with the Bar Shield and fancy bolsters. This is 1 of only 36 made. This is a 3 7/8 inch closed Cuttin’ Horse Sowbelly. 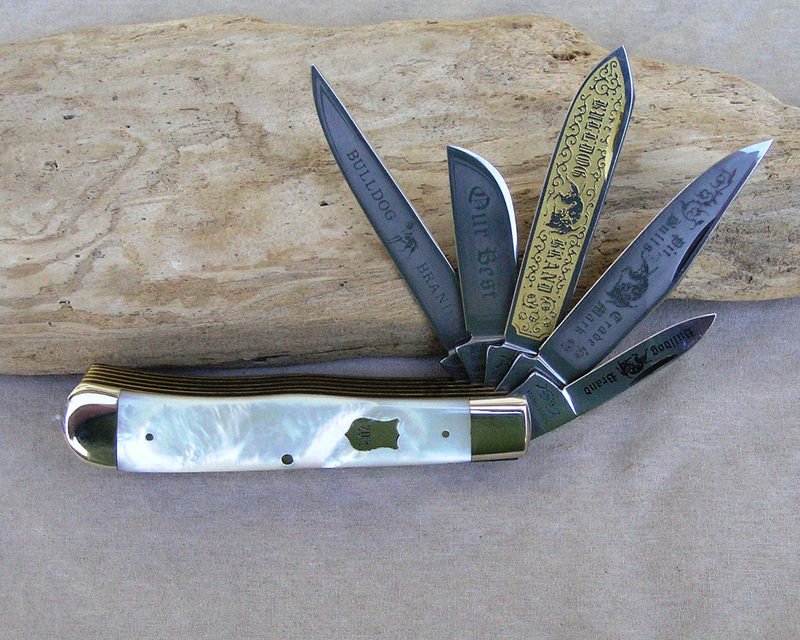 This knife features the Fighting Dogs tang stamp on all blades. The rear of the master blade is stamped with 1993. The master blade has the Cuttin’ Horse etch from the Third Generation. The reverse of the master blade is etched with ?Prototype 1 OF 3 Gen. Heart Abalone?. 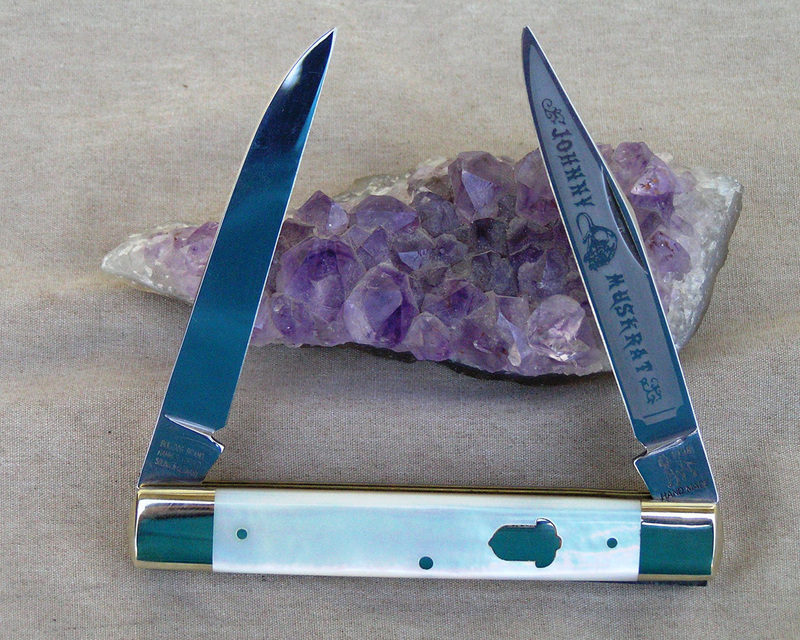 This knife was made in the Fourth Generation from parts left over from the Third Generation. 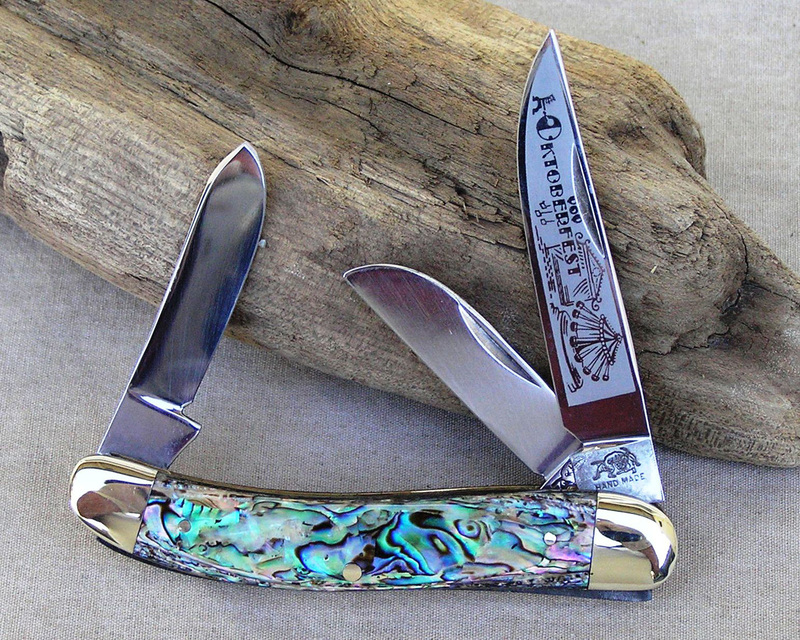 The handles are Genuine Heart Abalone and have NO Shield. Genuine Heart Abalone was not used in the third generation. This is a RARE knife, only 3 were made. This is a 3 3/8 inch closed Oktoberfest Sowbelly. 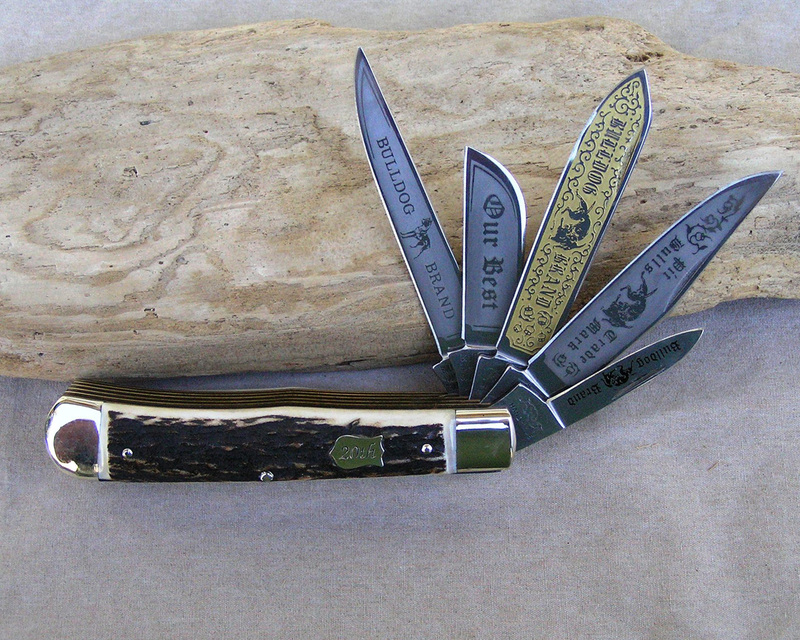 This knife features the Fighting Dogs tang stamp on the master and Sheepsfoot blades. The rear of the Sheepsfoot is stamped with 1984. The rear of the master blade is stamped with S&D Cut. Co. The master blade has the Oktoberfest etch from the First Generation. The reverse of the master blade is etched with ?Prototype 1 OF 3 Gen. Heart Abalone?. This knife was made in the Fourth Generation from parts left over from the First Generation. 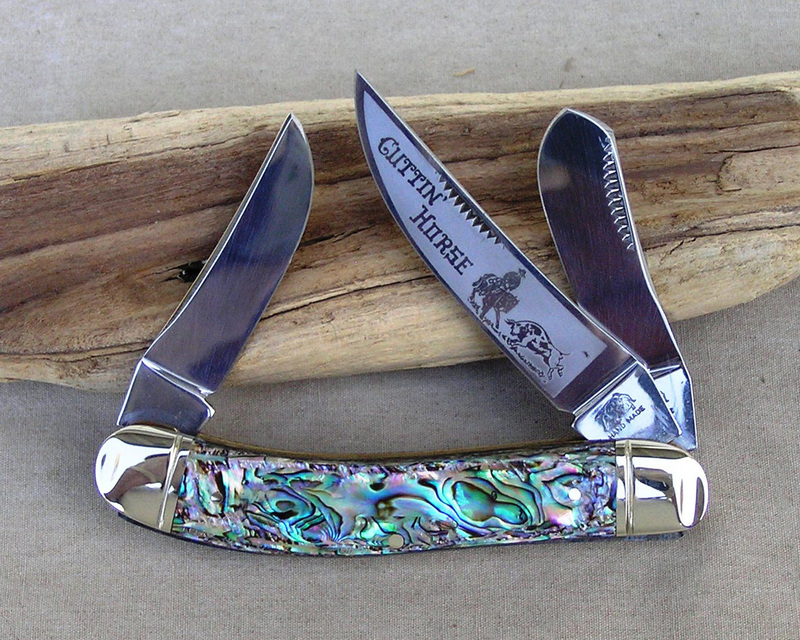 The handles are Genuine Heart Abalone and have NO Shield. Genuine Heart Abalone was not used in the first generation. This is a RARE knife, only 3 were made. This is a 3 3/4 inch closed SINGLE blade Copperhead. 1997 Standing Dog tang stamp. The master blade is has NO etch. The handles are Purple Swirl Celluloid and a Crest Shield. This is RARE KNIFE, only 5 were made. This is 1 of 5 ONLY! A Single Blade Copperhead is a very Unusual and RARE Bulldog knife for ANY GENERATION!